Brake cleaner and carburator cleaner are very similar products. The staff at the car parts store will very likely tell you that they are completely interchangeable and brand doesn't matter. And for some applications, that's exactly right. However, there can be a deadly difference in their chemistry. Brake cleaner or carburator cleaner removes brake fluid, grease, and oil, and it is very effective for removing the cosmoline used to protect guns and other tools for long-term storage or shipping. Well, it certainly should! 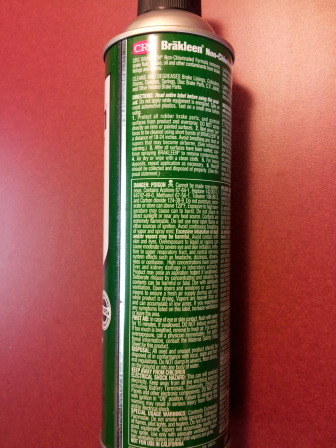 The label on the back of the can will warn that it contains acetone, heptane, methanol, and toluene, propelled out of the can by compressed carbon dioxide. See a closeup of typical label at the top of this page. But as nasty as that mixture is, it could be far more dangerous. Be very careful to avoid cleaning solvents that include tetrachloroethylene, also called perchloroethylene or PERC and other names. If you use chlorinated solvents to clean metal immediately before welding or otherwise heating it, you could easily be poisoned with lasting or even fatal effects. Tetrachloroethylene is a colorless liquid about 160% the density of water, commonly used for dry cleaning fabric. It's an excellent solvent for organic materials, those based primarily on carbon chains or rings with side branches of hydrogen and other elements. Unlike many other organic solvents such as acetone, toluene, and others, tetrachloroethylene is not flammable. This nonflammability makes it attractive for dry cleaning and industrial applications. It is much less volatile than other components of these spray solvent cleaners, so it will remain in pits and crevices after more volatile components like acetone and methanol have evaporated. The danger is that tetrachloroethylene oxidizes into highly poisonous phosgene at temperatures above 315 °C (or 599 °F). 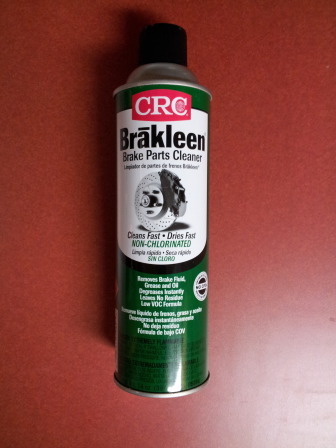 The can you see here of Brākleen brake cleaner is clearly labeled as NON-CHLORINATED. Always use non-chlorinated solvent sprays like this Brākleen product. Tetrachloroethylene might be easily confused with carbon tetrachloride, which has a very similar odor and has had similar uses. Carbon tetrachloride was used as a dry cleaning solvent and as a fire extinguisher from 1910 into the early 1940s. It also produces phosgene at high temperatures, making its use in a fire extinguisher rather hazardous. Models of carbon tetrachloride, CCl4. This is the deadly stuff. Phosgene is where things get dangerously interesting. The British chemist John Davy first synthesized it in 1812 by exposing a mixture of carbon monoxide and chlorine to sunlight, which contains ultraviolet radiation and drives the reaction. This is why chloroform is typically stored in dark brown tinted bottles. Phosgene was widely used throughout the 19th century in the chemical industry, especially in the manufacture of dyes. The U.S. CDC fact sheet on phosgene reports that immediate symptoms of exposure can include coughing, burning in the throat, burning and watery eyes, blurred vision, difficulty breathing or shortness of breath, and nausea and vomiting. Over the following period of up to 48 hours, delayed symptoms may appear including difficulty breathing, coughing up white to pink-tinged fluid due to pulmonary edema, low blood pressure, and heart failure. Most people who make it through the immediate effects of a phosgene exposure go on to make a complete recovery. But chronic bronchitis and emphysema can be long-term effects. Phosgene was used in combat during World War I, often in combination with chlorine gas. Mustard gas came to be far more notorious, and it may have been the most militarily effective due to the horror it caused, but phosgene killed far more people. Out of the 100,000 deaths caused by chemical weapons during the war, about 85,000 were caused by phosgene. U.S. Army poster from World War II. Both Japan and Italy used phosgene and other chemical weapons in their wars leading up to the World War. 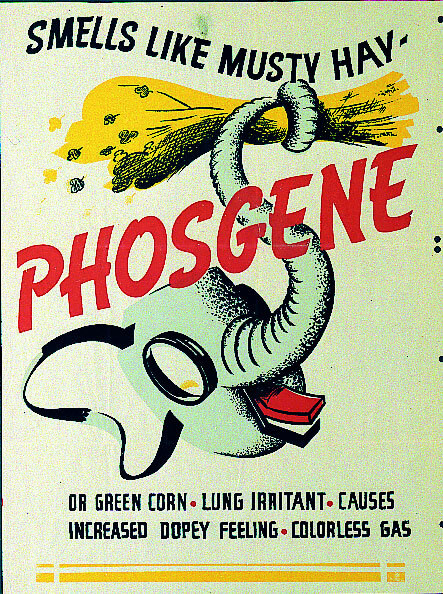 As the U.S. Army poster from World War II warns, phosgene has an odor that can remind the victim of musty hay or green corn. The problem is that the odor can only be detected at about 0.4 parts per million, while the threshold for toxic effects is only one-fourth that level. Phosgene works by disrupting the blood-air barrier in the alveoli of the lungs, leading to suffocation. The reaction is not immediate even at very harmful levels — many troops effected during World War I were not incapacitated for 24 hours or more. As for the warnings not to mix bleach and ammonia, that's because it produces entirely different dangerous substances: chlorine gas plus chloramine or NH2Cl. Mustard gas kills in a more painful way and is more of a horror weapon. It condenses onto the ground as an oily liquid and remains active in the soil for months under certain weather conditions. Mustard gas causes blistering, vomiting, and internal and external bleeding. Fatal exposures can take four to five weeks of pain to kill the victim. Gas was primarily used on the Western Front, but Germany deployed it against Russia on the Eastern Front and the British used it during the Second Battle of Gaza in Palestine. About 20% of the chemical shells fired on the Western Front were duds, leaving about 13 million unexploded shells buried in French and Belgian farm fields. A number of countries maintained secret stockpiles of phosgene gas in the 1920s and 1930s, but it was only used in large quantities by the Imperial Japanese Army against China in the Second Sino-Japanese War, which began 7 July 1937 and continued into the broader World War II. Japanese gas and biological weapons were produced by the notorious Unit 731 and authorized by specific orders from Emperor Hirohito or Shōwa-tennō himself. During the Battle of Wuhan from mid June through October of 1938, Hirohito authorized 375 separates uses of poison gas just in the period from August through October. Italian forces also used some phosgene during the Second Italo-Ethiopian War. During the Battle of Genale Doria on 12-20 January 1936 the Italians deployed some phosgene along with two tons of mustard gas against the Ethiopians. Don't use chlorinated solvents to clean metal before welding!